Make Your Journey Safer and Enjoyable. The easiest way to add Bluetooth function to your car stereo system; The fastest charger to fulfill your power-hungry smart devices in vehicle. 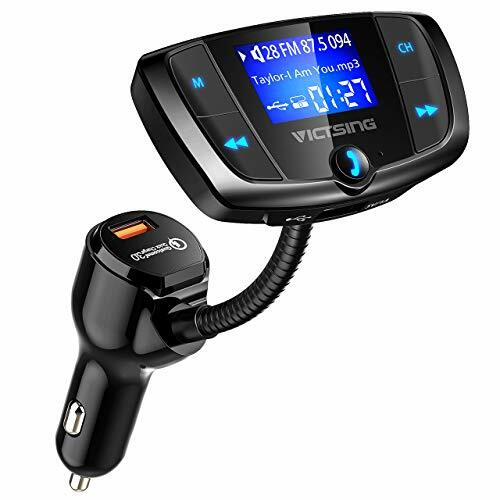 Automatically connect to the last paired smart device when you turn on the Bluetooth FM transmitter. Support A2DP, to achieve the stereo music lossless transfer to your car speaker. Built-in microphone feature can set free your hands during answering the calls and help you safely drive. Easily adjust the display screen to your habitual viewing angle. Compatible with iPhone 8,iPhone 8 plus, iPhone X, iPhone 7 iPhone 7 plus, Samsung, HTC, LG, Blackberry, Sony, Tablet and iPad etc.